“If I see any one from ISIS, I would hug him. They are the reason my brother is in heaven.” These were the words of Marianne, Bishoy Adly’s sister, shortly after he had been killed by ISIS on May 26, 2017. Twenty-nine Christians were killed that day when their three vehicles, on the way to the St. Samuel the Confessor Monastery, were stopped and attacked. The attack took place a few kilometers before the monastery. Jonathan Rashad visited two villages in Minya including the village of Nazlet Hana, which lost seven people in the attack, including two children and the village of Deir al-Garnos, which lost seven of its finest men who were all farmers and laborers that were set to do some work at the monastery. Deir al-Garnos is entirely populated by Christians; at least 20,000 live in the village. ISIS has killed seventy-five Christians in Egypt since the beginning of the year, including the two recent bombings at St. George’s Cathedral and St. Mark’s Cathedral that left forty-six dead. For more of Rashad’s photography, visit his website here. The father of 24-year-old Bishoy Adly, one of the 29 Christian Egyptians killed by ISIS last week. Born and raised in Nazlet Hana, Bishoy worked as a tailor. “Three days before the attack, Bishoy was talking with his friends about martyrdom and martyrs. It is like he knew he was going to be one,” said his father. The grandmother, mother, and sisters of Bishoy Adly. 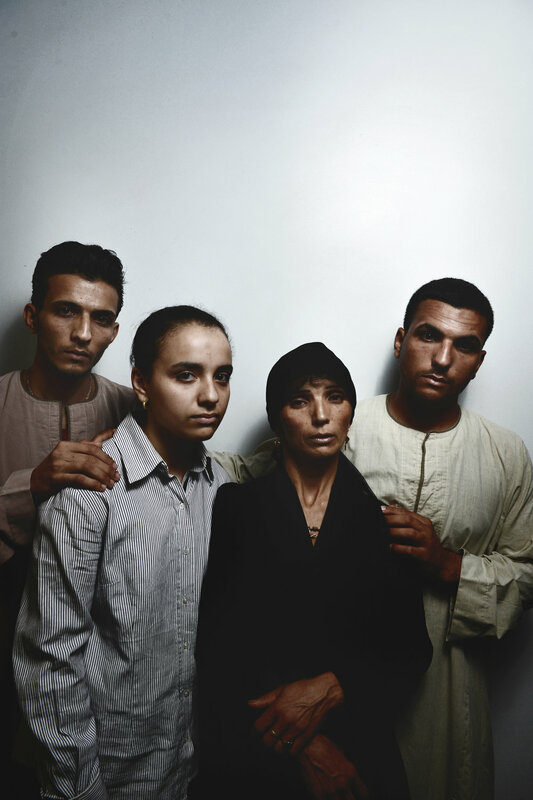 Both Bishoy’s mother, Safaa, 43 (right) and sister, Julia, 7 (bottom center), witnessed the attack. Seven-year-old Julia witnessed the killing of her 24-year-old brother Bishoy Adly. “Why must a 7-year-old girl watch her brother being slaughtered? Why?” asked Bishoy’s mother. The wife, sons, and daughters of 57-year-old slain farmer and laborer Eid Ishak. “My dad never refused to go to the monastery, even when he had important work at the farm. Christianity was his priority,” said Ishak, 20 (right), son of Eid. The father of 26-year-old Hany Adel Rizk holds a photo of his son. “I was working in a farm field when I got the phone call. Someone called me and informed me that my son had been killed by terrorists in the convoy. I fainted when I heard this. I went to the scene of the attack and found no one. Then I went to the hospital to find the bodies. It was a hard shock and I could not see or hear anything,” said Hany’s 63-year-old father. The wife, sons, and daughter of 55-year-old slain farmer and laborer Lamy Ishak. “May God forgive ISIS. We will never leave our faith. We never left Jesus,” said Nadia, 45, wife of Lamy. Marco, 14, and Mina, 10, sons of 46-year-old slain laborer Ayed Habib Tawadros. Their father was the driver of one of the three vehicles. Marco and Mina, who survived the attack, witnessed their dad being shot. “On the way to the monastery, someone holding a rifle stopped our vehicle. We saw that the other vehicle ahead of us was shot. When my dad got out of the car, he got a bullet in the head. Then two masked men came and started shooting all the men in the vehicle, except my brother and myself. They ran away, chanting ‘Allah Akbar.’ Before they ran away, one masked man pointed the rifle at me. Then his comrade asked him not to shoot me,” said Marco. 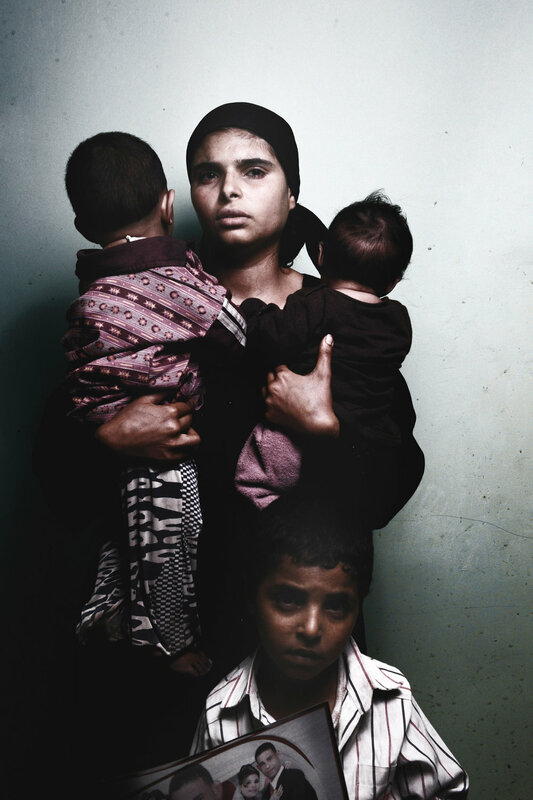 Nawal, 26, her sons Kirollos, 5, Mina, 2, and her daughter Erine, 4 months. “He had breakfast with me before he left and gave me some money to spend while he was away. He was going to work at the monastery to earn money for my eye operation,” said Nawal, wife of 32-year-old slain laborer Nasef Mamdouh Ayad. 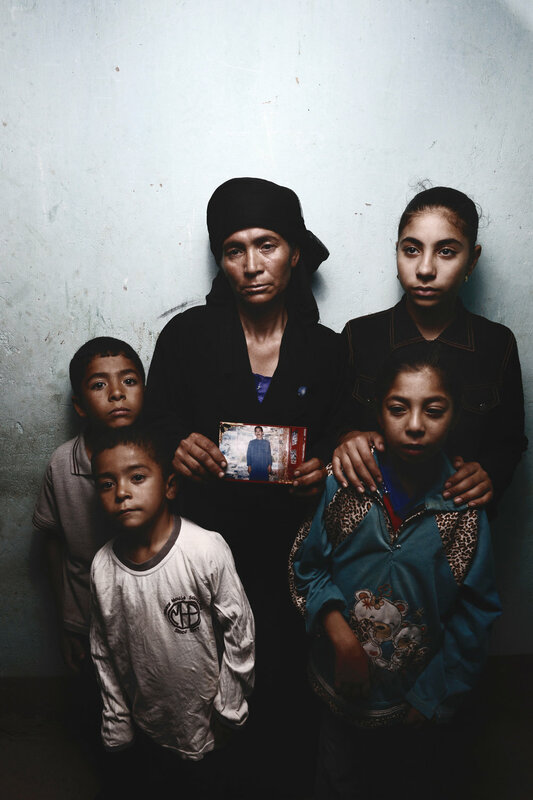 The mother, wife, brothers, sons, and 4-month-old daughter of 32-year-old slain laborer Nasef Mamdouh Ayad. “ISIS did him a favor. Now he is in heaven,” said Nasef’s wife. The wife, sons, and daughters of 38-year-old slain laborer Wahib Edwar. Deir al-Garnos is entirely populated by Copt Christians. At least 20,000 live in the village. Villagers of Deir al-Garnos hang a banner showing the portraits of the seven victims the village lost in the attack. Luiz Botros Hana, 39, stares at the village of Deir al-Garnos from inside its main church, Blessed Virgin Mary.